Now accepting applications for our 2018 Psychologically Healthy Workplace Awards! Sponsored by the Kentucky Psychological Foundation and the Psychology in the Workplace Network (PWN), the Psychologically Healthy Workplace Awards recognize organizations with programs and policies that foster employee health and well-being while enhancing organizational performance. Statewide award recipients will be eligible for national recognition and awards through the American Psychological Association. Contact us at [email protected] to express your intent to apply for the awards, or to nominate an organization you think deserves recognition. Register your organization in our online system. Complete the Main Application (an online checklist of organizational practices). Complete an Organizational Practices Questionnaire (online, detailed, essay responses). Send out an Employee Questionnaire (employees access online, about 5-10 minutes to complete). Have the PWN committee conduct an On-Site Visit (meet with the executive team, HR, employee focus groups). We work with every applicant to walk them through the entire process. The award process is mostly online and easy to do. Organizations tell us that they learn a lot from simply going through our awards process! Completing many of the online forms allows for organizations to see where they may need to focus their future efforts, or they validate what the organization is already doing. 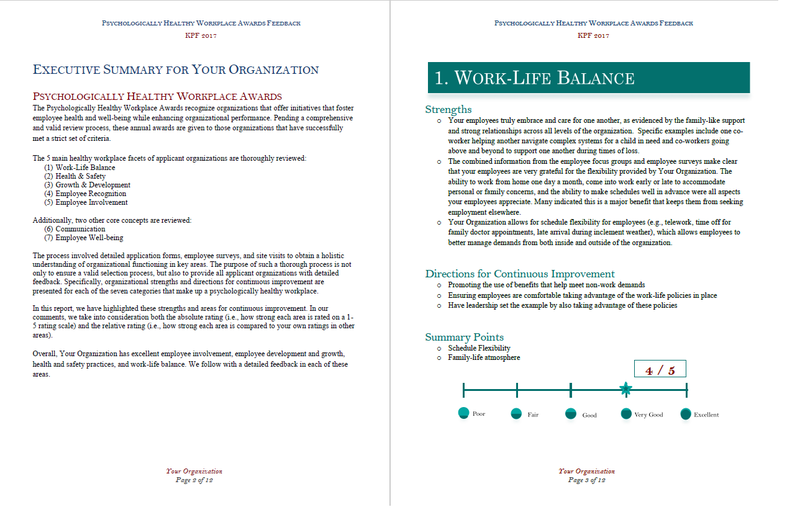 In addition, finalists for the awards are given a free, detailed feedback report (example pictured below) that identifies strengths, areas for improvement, and summaries of the evaluations in all areas of a psychologically healthy workplace. Why a Psychologically Healthy Workplace?...Healthy Employees are some of our most valuable assets!